It is not often that readers get a clear-cut choice between two forecasts. Most forecasts have wiggle room. Not the following. 1. The United States government will default. 2. The United States government will not default. I hold the first position. John T. Harvey holds the second. He wrote a piece for Forbes defending his position: "It Is Impossible For The US To Default". I regard this as the most fundamental economic issue facing the U.S. government. I regard it as the most fundamental economic issue facing Americans under age 60. With so many economic, political, and social problems facing us today, there is little point in focusing attention on something that is not one. The false fear of which I speak is the chance of US debt default. There is no need to speculate on what that likelihood is, I can give you the exact number: there is 0% chance that the US will be forced to default on the debt. That is the kind of forthrightness that I appreciate. Here is my response. With so many economic, political, and social problems facing us today, it is crucial that we focus attention on something that is both catastrophic and inescapable. The fear of which I speak is the chance of U.S. debt default. There is no need to speculate on what that likelihood is, I can give you the exact number: there is 100% chance that the U.S. will be forced to default on the debt. Why do I believe this? Because I believe in the analysis supplied by Professor Lawrence Kotlikoff of Boston University. Each year, he analyzes the statistics produced by the Congressional Budget Office on the present value – not future value – of the unfunded liabilities of the U.S. government. The latest figures are up by $11 trillion over the last year. The figure today is $222 trillion. This means that the government needs $222 trillion to invest in private capital markets that will pay about 5% per year for the next 75 years. Problem: the world's capital markets are just about $222 trillion. Then there are the unfunded liabilities of all other Western nations. These total at least what the U.S. does, and probably far more, since the welfare state's promises are more comprehensive outside the USA. Conclusion: they will all default. Mr. Harvey thinks that the U.S. government could choose to default, but it won't. We could choose to do so, just as a person trapped in a warehouse full of food could choose to starve, but we could never be forced to. This is not a theory or conjecture, it is cold, hard fact. The reason the US could never be forced to default is that every single bit of the debt is owed in the currency that we and only we can issue: dollars. Unlike Greece, we don't have to try to earn foreign exchange via exports or beg for better terms. There is simply no level of debt we could not repay with a keystroke. There are a lot of people inside the camp of the gold bugs who also believe this. They are probably wrong. They are wrong for the same reason why Mr. Harvey is wrong. They do not understand Ludwig von Mises. Mises was a senior advisor to the equivalent of the Austrian Chamber of Commerce after World War I. He understood monetary theory. His book on money, The Theory of Money and Credit, had been published in 1912, two years before the war broke out. In the post-War edition of his book, he wrote of the process of the hyperinflationary breakdown of a currency. He made it clear that such a currency is short-lived. People shift to rival currencies. The emancipation of commerce from a money which is proving more and more useless in this way begins with the expulsion of the money from hoards. People begin at first to hoard other money instead so as to have marketable goods at their disposal for unforeseen future needs - perhaps precious-metal money and foreign notes, and sometimes also domestic notes of other kinds which have a higher value because they cannot be increased by the State '(e.g.the Romanoff rouble in Russia or the 'blue' money of communist Hungary); then ingots, precious stones, and pearls; even pictures, other objects of art, and postage stamps. A further step is the adoption of foreign currency or metallic money (i.e. for all practical purposes, gold) in credit transactions. Finally, when the domestic currency ceases to be used in retail trade, wages as well have to be paid in some other way than in pieces of paper which are then no longer good for anything. The collapse of an inflation policy carried to its extreme - as in the United States in 1781 and in France in 1796 does not destroy the monetary system, but only the credit money or fiat money of the State that has overestimated the effectiveness of its own policy. The collapse emancipates commerce from etatism and establishes metallic money again (pp. 229-30). In 1949, his book Human Actionappeared. In it, he discussed hyperinflation. He called this phase of the business cycle the crack-up boom. The characteristic mark of the phenomenon is that the increase in the quantity of money causes a fall in the demand for money. The tendency toward a fall in purchasing power as generated by the increased supply of money is intensified by the general propensity to restrict cash holdings which it brings about. Eventually a point is reached where the prices at which people would be prepared to part with "real" goods discount to such an extent the expected progress in the fall of purchasing power that nobody has a sufficient amount of cash at hand to pay them. The monetary system breaks down; all transactions in the money concerned cease; a panic makes its purchasing power vanish altogether. People return either to barter or to the use of another kind of money (p. 424). Later in the book, Mises discussed the policy of devaluation: the expansion of the domestic money supply in a fruitless attempt to reduce the international value of the currency unit. If the government does not care how far foreign exchange rates may rise, it can for some time continue to cling to credit expansion. But one day the crack-up boom will annihilate its monetary system. On the other hand, if the authority wants to avoid the necessity of devaluing again and again at an accelerated pace, it must arrange its domestic credit policy in such a way as not to outrun in credit expansion the other countries against which it wants to keep its domestic currency at par (p. 791). Mt. Harvey has described just such a policy. He concluded that the United States government can never go bankrupt. It can print its way out of every obligation. The expansion of the monetary base can go on until such time as commercial banks monetize all of the reserves on their books. Prices then rise to such levels that transactions no longer take place in the official currency unit. The division of labor contracts. The output of capital and labor falls. At some point, people adopt other currency units. They no longer cooperate with each other by means of the hyperinflated currency. Professor Steve Hanke has co-authored an article on the worst 56 hypernflations. He discovered that most of these in industrial nations were over in a couple of years. The crack-up boom ended them. No nation can long pursue a policy of hyperinflation. It destroys the currency and destroys the division of labor. The result is starvation. The policy of hyperinflation ends before this phase. Members of society shift to other forms of money. This is why the policy of hyperinflation is useless in dealing with the 75-year obligations of the federal government to support old people through Social Security, Medicare, Medicaid, and federal pensions. These obligations are inter-generational. Hyperinflation lasts for months, not decades. When the government ends its policy of hyperinflation, it finds that it is still saddled with these obligations. If the Federal Reserve resorts to hyperinflation, its retirement portfolio will reach zero value unless it shifts to foreign currencies, gold, or other hyperinflation hedges. It will publicly announce that the U.S. dollar is a failed currency, as manipulated by the FED. If it refuses, then it will oversee Great Depression 2, monetary deflation, and the contraction of the division of labor. The U.S. government will go bankrupt. 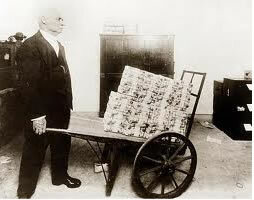 If Congress nationalizes the FED, then it will pursue hyperinflation. The crack-up boom will end the experiment. At that point, all of the obligations to retirees will still remain. But the government will not have the money to pay them. The $222 trillion of present valued unfunded liabilities will still remain unfunded. The government's obligations are inter-generational. Hyperinflation is not. The latter in no fundamental way reduces the former. This means that the government will default. This is 100% guaranteed. Mind you, that doesn't mean there might not be other economic or political consequences. Inflation and currency depreciation, for example, are possibilities. Yes, they surely are, since they are the same thing. But they do not solve the problem of the inevitable default. They merely add to the misery before the default. Indeed, we have seen neither hide nor hair of inflation or high interest rates during the current run up of the debt. It is critical to bear in mind, too, that these deficits are not a result of the government trying to buy something it cannot otherwise afford (as would be the case for you or me). Rather, they are setting out to generate sufficient demand for goods and services to employ all those willing to work (that said, not every kind of government spending does this effectively, but that's a different question). As there is no limit to how much debt we can successfully carry, we should be aggressively pursuing the latter goal rather than talking about being "fiscally responsible." There is nothing responsible about leaving over 12 million Americans out of work. We have plenty of problems in the world. No point in making one up. This appeared in Forbes. The article cited a list of supposed experts, with Alan Greenspan at the head of the list. Somehow, the author expects us to take his argument seriously. We are also supposed to take his cited experts seriously, beginning with Alan Greenspan. We are supposed to imagine that debts are forever, that they need not be repaid, that credit is eternal, that the Baby boomers are not retiring by the millions, that digits can overcome economic theory, that Medicare is solvent, that Social Security is solvent, and that hyperinflation is always available as a way for the government not to default. The nation is run by people who share his views. So is every Western nation. This is a very good reason to prepare for a catastrophe, if we are lucky, or possibly several: (1) mass inflation, stabilization, deflation, depression, and government default, or (2) hyperinflation followed by a default. Take your pick.